Caminhos uses the communicative approach which covers all aspects of language skills such as reading, writing, speaking and listening. Special beginner group course for students with advanced level Spanish or Italian. Our Conversation Classes are fun, dynamic and in an informal setting which encourages student interaction. Private Classes tailored to your individual needs. Class scheduling is flexible, you can choose the date, time, location and the number of hours. Private Classes focused on Celpe Bras Exam preparation. Class scheduling is flexible you choose date, time and destination. Exciting and dynamic Portuguese classes onsite or outside, exploring the city of Rio de Janeiro. A weekend of Private Classes and cultural activities at a destination in Rio de Janeiro where you will have a total Brazilian immersion experience. A combination of Portuguese Intensive Classes and One-on-One Private Classes. 30 to 40 hours per week to satisfy the total requirements for Bildungsurlaub in your selected state. 120 – 140-hour programs to satisfy the requirements of your University. Private Classes for executives tailored to individual needs in-company. A weekend of Private Classes and cultural activities at a destination in Rio de Janeiro designed for executives needing to learn Portuguese fast. Portuguese survival course of 4 hours which helps you with the basics of Brazilian Portuguese. Private Classes and material specifically created for flight attendants. 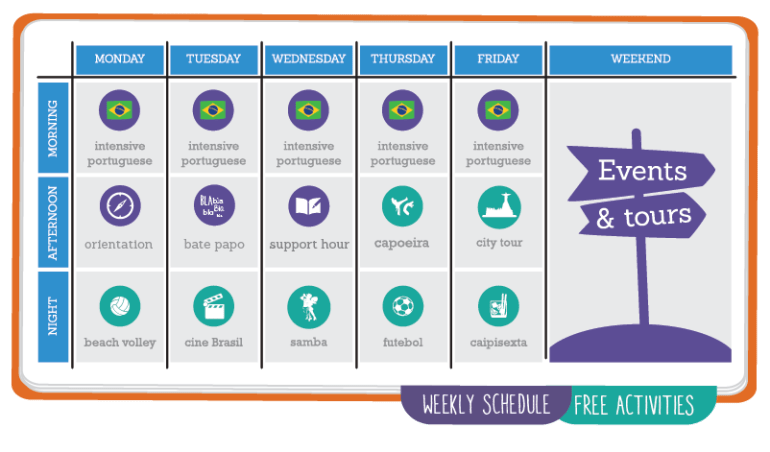 Still not sure which Brazilian Portuguese course to pick? 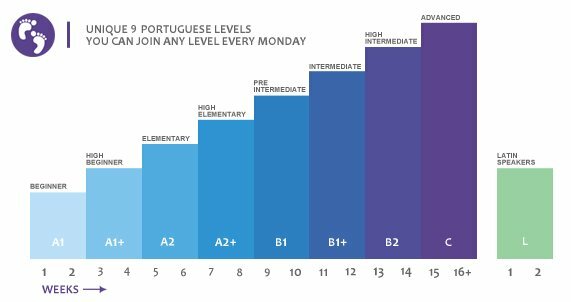 If you are looking for a high quality, competitively-priced Portuguese Group course our “Caminhos Intensive” course is the best option for you. It is also the right choice if you are looking for a dynamic setting and you enjoy meeting people from across the globe. If you are looking to improve your Portuguese conversational skills we recommend you our “Caminhos Talk” group course. Caminhos talk can also be complementary for an intensive group course. If you are looking for Portuguese courses in Brazil adjusted to meet your personal needs, schedule and/or location, we recommend you take our “Caminhos Private Classes“. Some people who struggle with the pace in the intensive group courses take complementary Portuguese private lessons. For those who don’t want to miss a minute of the ‘Cidade Maravilhosa’ (‘Marvellous City’) and would prefer to learn Portuguese outside of a traditional classroom setting, “Portuguese Immersion Program” is the Brazilian Portuguese course for you. Our teacher-guide will show you around the city while teaching you Brazilian Portuguese. For those who are coming to Rio de Janeiro in a group, we offer special group packages that can be designed entirely to suit your group’s needs. We also offer a number of accommodation options, including ‘homestay‘, a popular option which enables you to stay with a local Brazilian family. And for your peace of mind, Edson, our driver, can pick you up from the airport and take you directly to your accommodation. If you are still unsure which Brazilian Portuguese course is right for you, feel free to contact us for more information. Download your level test here (complete beginners do not need to do a level test) if you’re interested in group classes. If you are doing Private Classes, please download our Questionnaire here. If you are a complete beginner, you should start at the beginning of A1 (see Calendar), otherwise buy additional private classes.